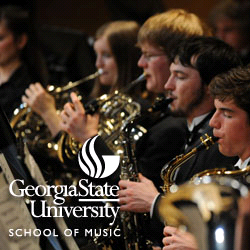 The Georgia State University School of Music offers one of the most comprehensive music programs in the Southeast, including studies in performance, composition, music management, music education, recording/technology and jazz studies. The School annually presents more than 250 recitals, music workshops and community music concerts including performances by guest artists, faculty and students at the 800-plus seat Rialto Center for the Arts and the newly renovated 400-seat Florence Kopleff Recital Hall. Musical offerings range from jazz ensembles to string quartets – including performances by the University choruses and orchestras. The majority of concerts are free and open to the public.